Healing can occur when we are prepared to face, accept, and then work through the emotional issues which are connected with the physical illness. We can also turn inward for healing by accessing that place of the “silence of one’s being”. One’s inmost silence, a place of wholeness and beyond limitations that is free from disease, is reached in deep states of dhikr (the remembrance of God) or meditation. Essentially there are three levels of health we need to care for: one is our body and in that regard, there is a lot of up to date check lists that you can download also from the internet to do with nutrition, diet, exercise and all physical intakes including of course, air, water and other things we ingest. More important than intake are the items, which are commonly available nowadays, and which are to be avoided, such as bottled fizzy drinks, sugars and refined carbohydrates, such as cakes and colorants and preservatives in snacks and sweets. Our biology is not designed for fast foods. And also the importance of regular exercise and presence of mind and heart during leisure and sport. The second level is mental hygiene. Clear thoughts, good thoughts, good talk, and pure heart. The third and most important level of health is purity at heart. The light of the soul is dimmed or completely veiled with a heart full of fear, hatred and anger. Once the body is clear of toxins and the mind is sharp and alert, and the heart is pure, then the serious challenges to humanity begins. How to now live your divine nature, the sacred soul in your heart? The purpose of life on earth is to practice this. From there on, physical death becomes unimportant, you have already tasted the eternal nature of your soul. All religions aspire to take their adherence to this state of enlightenment. Listen with your ears and look with your eyes -- and then shut down your senses and pick up the signs of your heart. Good luck. The above message was sent to a student of Shaykh Fadhlalla and was shared. This brief message summarizes the main three aspects which need harmony in order to be whole. The disharmony and imbalance is what causes illness and hence there needs to be understanding that not only our body needs food and nutrition for its proper functioning, but also the mind (thoughts and emotions) and heart (spirituality and soul level) need them also according to their nature. When you are sick, the solution is not putting more drugs into the body. Health begins by understanding and then eliminating the problem. That understanding is the subject of this series of articles on Healing. The human drive for well-being, harmony and happiness and avoidance of sickness, discord and misery can be a great force to realise the source and essence of life - the free and joyful soul within. The human soul is ever-free, content and stable, and is not subject to the changing world of duality, insecurity and uncertainty experienced by the ego-self. The reality in which we live in, it has a hologram like nature. Take each small slice of the reality and you will find the same phenomena that you would find in the largest or whole. 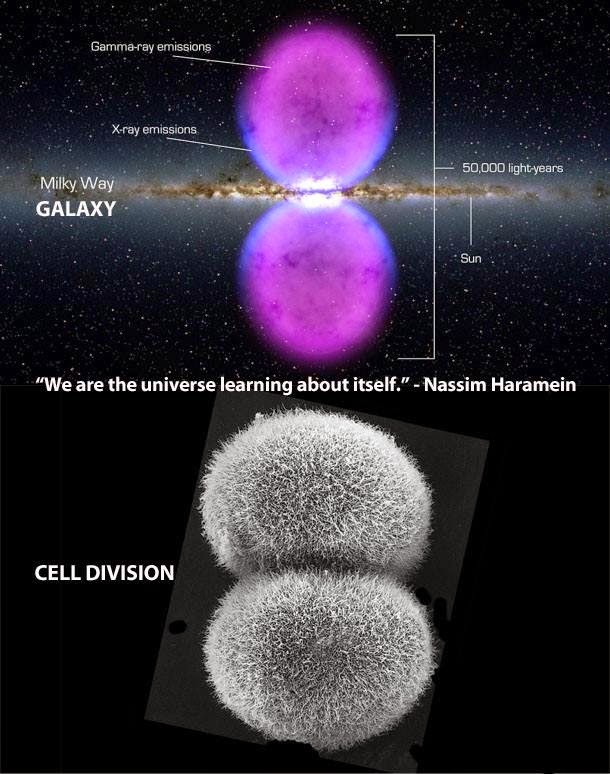 Think of the cell division vs. how milky way galaxy looks like. 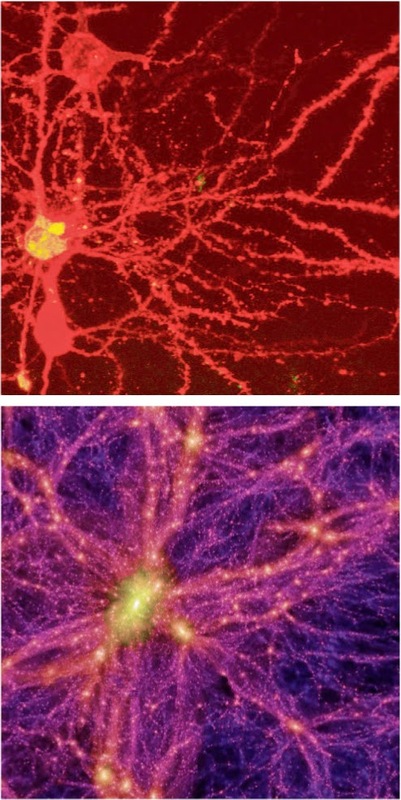 Think of how our brain cells look like and captured image of our galaxy. They have mind blowing similarity. The above two examples are just two Sign posts about our reality, something that neutral and unbiased view of science can point us to. This aspect of reality tells us that there is a mirroring here. The small reflect the big, no matter how contrast the sizes are. In the east the reality is compared to a city of mirror. Mirror precisely because it reflects and reflects back again and again. In Sufic science a very important element of the reality is the unseen reality, alam al-ghayb. Even though we can not see that reality (like dark energy/ dark matter) and yet just as the visible universe is only a small fraction of the invisible universe (composed of dark energy and dark matter) similarly the seen world is a very tiny fraction of the unseen world. The visible and physical world is governed by physical laws which are universal and true across the universe. Similarly the invisible and non-physical (spiritual) world is governed by non-physical (metaphysical or spiritual) laws. We know that the reality is indivisible. Thus seen and unseen world are inter-penetrated, inter-woven. When it comes to what constituent human being is both physical, then mental and emotional and finally spiritual - each is more subtle than its previous one. When someone suffers a mental or emotional shock that can trigger a heart attack - or when we are very depressed we feel unwell even in our body, we feel lack of energy of lethargic. These are examples how one aspect of our being can affect another, in this case metal affecting physical. Likewise, the most subtle part of our being is spiritual. Spiritual healing does take into account the unseen reality, which is our spirit or soul. According to the cosmology of spiritual healing - every imbalance or most imbalances of our physical body has its root into more subtler body (emotional and spiritual) or due to violation of the spiritual law(s) or disturbance of spiritual well-being. For example, if we fail to give proper nutrition that is food into our body on regular basis we feel hunger, eventually feel weak - similarly if our emotional body or our mind is not fed with the right kind of emotions, right kind of thoughts, superior thoughts and instead is poisoned by improper thoughts and lack of right nutrition of mind, then it can suffer lethargy, depression, lack of interest in anything etc symptoms can kick in. Same applies for the spirit or the soul. Lets ask this question to ourselves. How much effort do we give to nourish our spirit / soul? Do we know what kind of nutrition feeds it? We put so much effort into feeding the physical body, how about our emotional body and most importantly our spiritual body? According to the mystical point of view there is one chief root, which can be called a common cause, from which all diseases are derived, and that is disorder of rhythm. For example: the upset or disorder of the nerves is stated by scientists to be the chief origin of all of the mental diseases. The Wonderful Architect, The Glorious Originator of all, the Master Designer has created everything, every single thing with rhythm. From the movement of the atoms and molecules to the movement of the heavenly bodies, suns and moons to the works of biological bodies, the change of seasons - everything has a rhythm, a pattern, a governing immutable law which it follows. This is called the Command of the Chief Commander, the Divine Commander. Now we human beings are positioned uniquely in the universe that we are also gifted with limited free-will. We are endowed with reason, capacity to think, capacity to discriminate between right and wrong - though through continuous and repeated abuse, neglect and ignorance we may choose to destroy that capacity. As human beings with limited understanding or veiled understanding we often violate the immutable divine laws, we abuse our sacred nature by becoming corrupt and following our shadows and this cause disharmony and disorder of rhythm within us, and this is the essential cause of all our illness, be it physical, emotional or spiritual or any combination of them. What I just mentioned above may sound very unscientific, superstitious from medieval period or even crazy - but guess what? 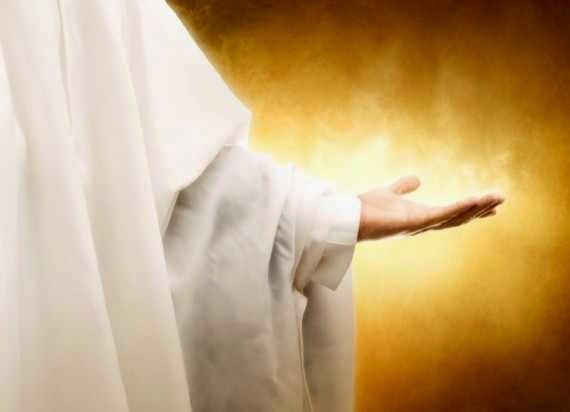 One of the greatest spiritual healer, the archetypal healer, Jesus Christ's healing will prove that all of the healing were spiritual in nature and they were also cured through spirit, even though the disease or the symptoms may manifest in physical body. In fact it is the physical body which is the place of manifestation in this world and hence all disharmony of the unseen will eventually end up manifesting in the seen world, which for our case is our physical body of blood, flesh and bones. One of the most important faculty of the unseen body is the spiritual heart. In Arabic its called QALB which comes from the root Q.L.B that gives birth to many meanings including that which turn. Indeed heart turns, the physical heart turn endlessly, so does the emotional and spiritual heart. Its in constant motion, thousands of thoughts come and go into the mind, hundred shades of spiritual state appear and disappear in a day or so. its constantly turning. The more we understand the nature of our spiritual heart, the more equipped we are to feed it, nourish it, bathe it with light. The term “heart” has different and multi-level connotations in the Islamic tradition. It is not simply the organ of emotions, “feelings” and desires, or decisions and opinions, but goes to encompass the soul, knowledge, bravery and more. When purified it is the seat of the intellect, i.e. the ray of the Divine within the creatures. It is the only placeless place which the King of kings reserves for His Throne. Heart is called the “true essence of a human being” (Al- Jurjani), containing “all levels of inner being” (al-Hakeem al- Tirmidhi), and for the Prophets (s) it is the place of revelation. In the sacred tradition we find that God says, "Nothing in the heaven or earth can contain Me, but the Heart of a true devotee may contain Me." Let us understand the tremendous value of the above tradition. And also lets understand the fact that we all carry that spiritual heart within and is it not time to pay more attention to our heart? Good news is that when you explore Spiritual Healing, you must pay attention to the Heart. Our Master (s) said, "If heart is good, whole body is good; if its corrupt then whole body is like that." If you are interested to heal yourself, you must begin with the Spiritual Heart. And that beginning is with the knowledge of the Spiritual Heart and we go back to the direct source of divine knowledge, which is the Final Testament, the Criterion, the Glorious Light where we are given direct glimpses on the reality of the Spiritual Heart. No other scripture has so much to transmit and communicate about the reality of heart than Qur'an. Click the middle column to go to the complete Sign (verse) and read the entire context of the Sign to understand better. They are all knowledge to understand reality of the heart. There are many more Signs in the Qur'an and each of these gems may unveil different treasure for you. The Divine Messengers, the Communicators were all healers and purifiers of spiritual heart. That was a task they all had to perform. Awliya Allah are the spiritual inheritors of the Prophets and they continue to impart their function as physician and healers of the heart, which when cured, when is pure, success on the Day of Judgment is guaranteed, by Allah’s command (26:88-89). Hazrat Inayat Khan in his book Healing and the Mind World wrote: "Consciously or unconsciously every being is capable of healing himself or others. This instinct is inborn in insects, birds, and beasts, as well as in man. All these find their own medicine and heal themselves and each other in various ways. In ancient days the doctors and healers learned much from animals about the treatment of disease. This shows that natural intuition has manifested in the lower creation as well as in the higher." If Jesus Christ could heal, don't you think you being a member of God's family can also heal? Don't you think that you are also endowed with the amazing capacity to heal yourself and others? Here is a good news for you. We are all given capacity to heal. Not only human beings, but all sentient beings. You may not see that happening, we may not understand all of it, but think this - the birds, the animals, the insects in the wild or fishes in ocean don't go to doctors or they don't have hospitals; and yet when imbalance happens to their body, they mostly heal themselves, they cure themselves. Sometime one help the other to heal. We as human beings have many hidden ability to heal that we are just unaware. A mother heals pain of her child unconsciously when the child falls or have ache. This happens all the time and hence we kind of neglect it. Our own voice has healing capacity, so does a mother's voice for its infant or child. Our voice, the human voice, can be used as a tool for self- awareness, which is the foundational mindset to heal oneself. With proper training, you can use your voice as a "sonic tool" to vibrationally activate, heal, resonate/harmonize body, mind and spirit. Human voice can change state of consciousness almost instantaneously. It balances hemispheres of the brain, re- wires neural nets, and changes the vibratory pattern of the etheric, emotional, mental, and bioelectric bodies. Here is an elegant Secret: The way we use our voice is a clear indicator of our self- esteem. Changing our voice, its tone can change the whole way of expressing ourselves in the world - and how the world sees us! One’s entire history is recorded in every cell of one’s body: when you speak the truth to your body you can change your life.